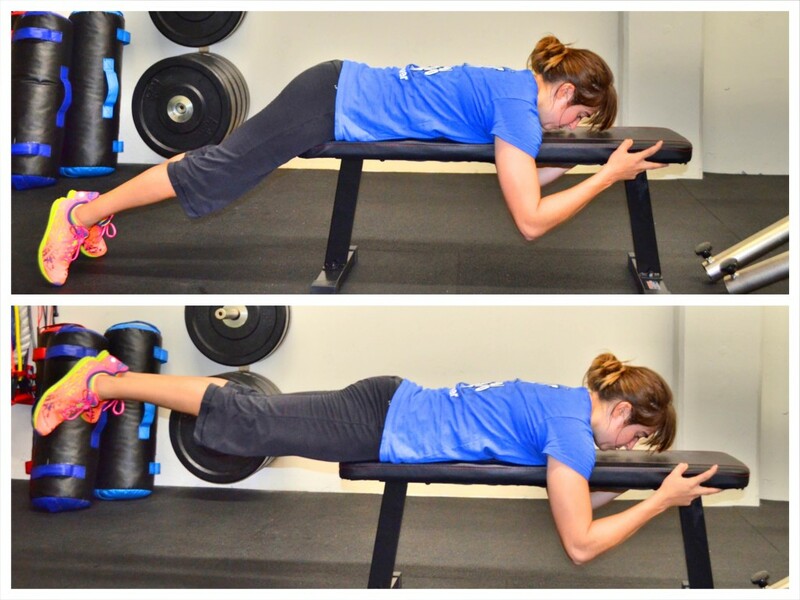 All too often our posterior chain is neglected in our workouts – especially our core workouts. We tend to focus on the abs and do a whole bunch of crunches. But if we want to strengthen our core, we have to work more than our abs. We have to work everything from our shoulders to our knees on both our front and backside. And one great exercise to strengthen the backside of your core is the Superman Exercise. The Superman Exercise is a great bodyweight core move that works the stabilizing muscles of your back as well as your glutes, hamstrings and shoulders. 1. 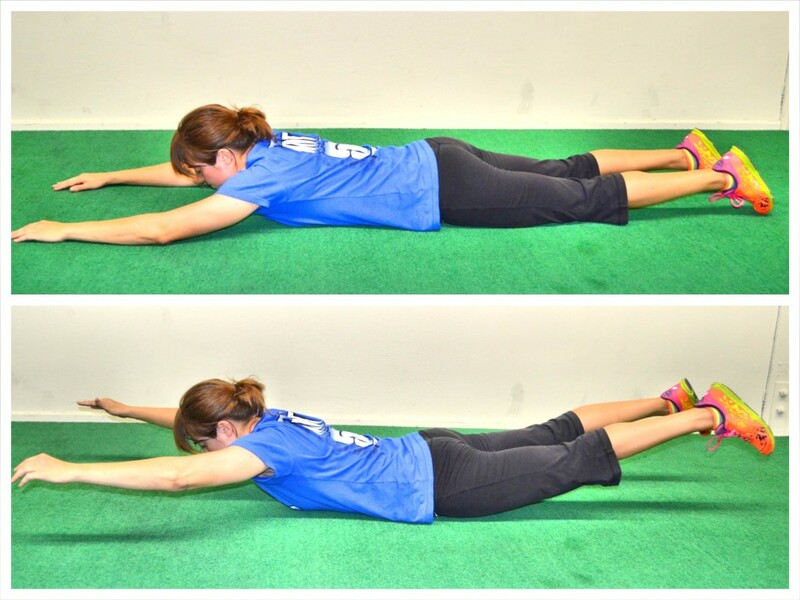 Lie face down on the ground with your arms out straight overhead on the ground and your legs out straight behind you. 2. Everything should be relaxed and your neck should be in a neutral position. 3. Then squeeze your glutes, back and shoulders to raise your chest and legs up off the ground. Try to get your chest up as high as possible as well as your quads. Keep your neck in a neutral position. 4. Hold up off the ground for a set amount of time then lower back down. 5. Keep your arms and legs straight as you lift but do not lock them out. Do not bend your knees to try to get your quads higher up off the ground. 6. Make sure to really squeeze your glutes as you lift so your low back doesn’t do all the work. And also make sure not to shrug as you lift your upper body up. Beginners may want to perform shorter holds or only lift one hemisphere (upper or lower) at a time. By only lifting their upper or lower body at a time, they lessen the strain of the move while still working their posterior chain. 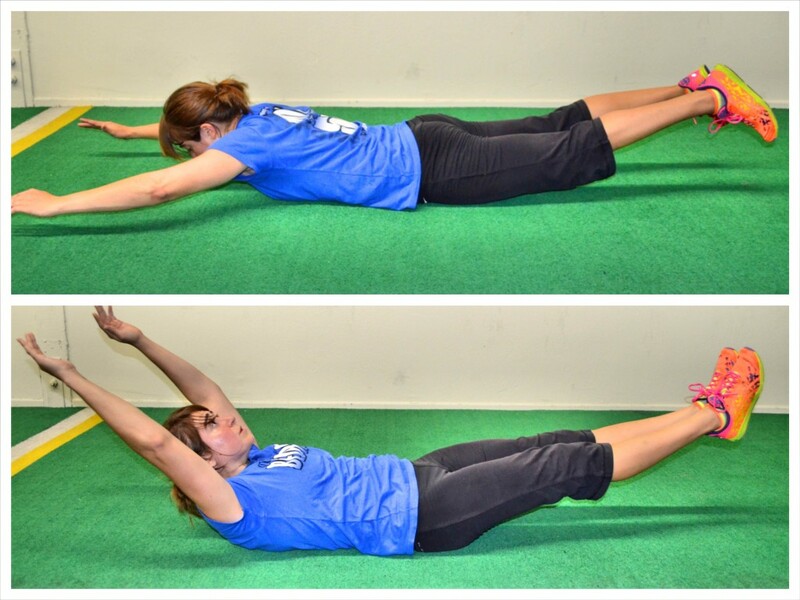 Even advanced exercisers may want to mix up the Superman Exercise by only performing an upper body or lower body lift. You can even do an upper body hold, followed by a lower body hold and then the full Superman Exercise if you want. Holding in each way activates the muscles differently. You can even advance the upper and lower body holds by bringing the moves up off the ground. And Hyper Extensions are just a variation of the upper body portion of the Superman. However, they also allow you a bigger range of motion and many people will even weight them down to make them more challenging. They also work your glutes as well as the muscles of your back. 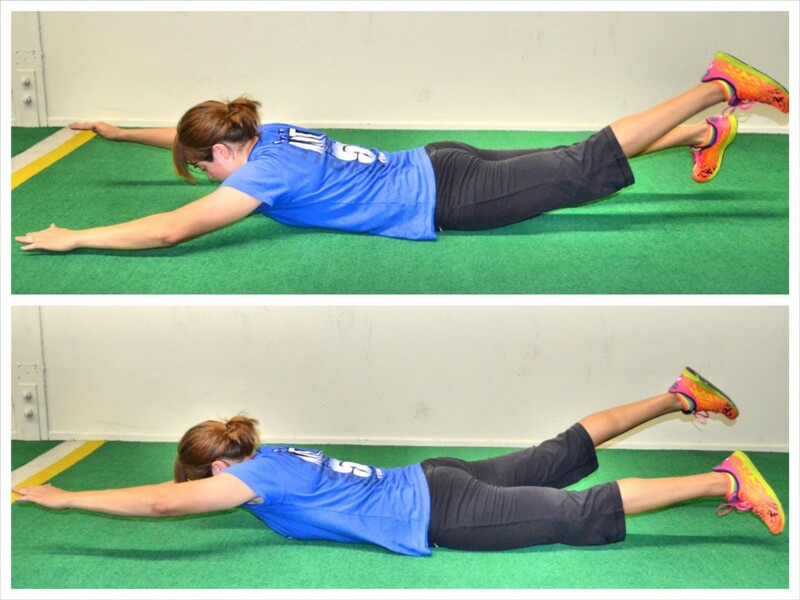 The Swimmer is another variation of the Superman Exercise done from the ground. It adds in a bit of movement to the exercise. For the Swimmer, you will set up exactly like you are performing the Superman; however, once you are up and holding, you will flutter your arms and legs as if you are swimming. Raise the right arm and left leg up a bit higher then lower them as you raise the left arm and right leg up. Try not to rest the opposite arm or leg on the ground as you flutter. Try to keep your chest and quads up off the ground. Another great Superman Exercise variation works the entire core and is called Superman/Banana.To do this move, set up at the top of Superman. Then, keeping your arms and lower legs up off the ground, roll over onto your back. Try not to push off with your hands or feet as you roll. Then roll back over into Superman. Again do not push off with your arms or legs. Hold in each position (Superman and Banana) for a few seconds before rolling back over. Have some fun with the move too! You can do longer holds and shorter holds. You can even do some “side bananas” where you hold on your side. (Side Bananas are a great oblique move! ).